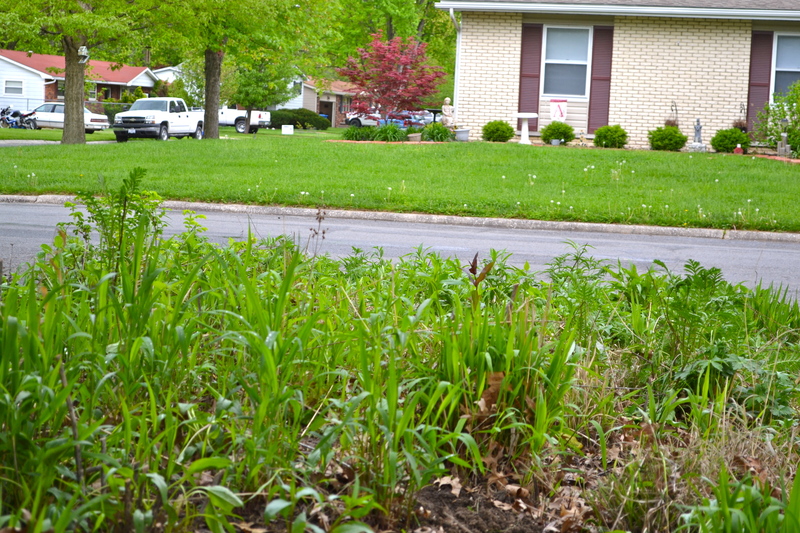 The prairie restoration section of my garden is not such a big piece of real estate… something under 200 square feet at most. But, having replaced the lawn and being situated in our front yard on a public thoroughfare, it is highly visible, It is my noisy, aesthetic, and politicized rejection of sterile American lawn-based landscaping. Its front and slightly-off-center location, and the presence of 3 – 6 feet tall plants mean this little garden packs a massive visual wallop. A well-established prairie is mostly an easy keeper. Prairie plants and forbs have root systems that are sometimes three to four times the length of the top growth. I have not watered this garden in over a decade despite the fact that the mid-west suffers regular heat waves, and droughts so devastating that they bring agriculture and even barge traffic on the Mississippi to a halt. When my neighbors have given up on watering their lawns, defeated by the cost of water (or by city ordinances against watering), this garden still vibrates with color and life. It hums with constant pollinator foraging. The crickets are deafening. Songbirds bob on the grass stems, eagerly stripping them of seeds. Dragonflies utterly control the prairie airspace. Prairies evolved with wildfires, and need them to thrive. One chore that can’t be skipped is the controlled burn, which typically takes place every three years. Controlled burns are important because they kill non-native invasive weeds, open up space for new native seeds to germinate, and release nitrogen back into the soil to reinvigorate plants that break dormancy in the charred soil surface. This year, however, I am facing a prairie nightmare: an invasion of unwanted species — some sort of ragweed-from-hell, a native but nevertheless trashy and aggressive hairy aster, and tall fescue. We also had an unwanted explosion in numbers of the very aggressive native Missouri Primrose. Although we burned very successfully in 2008, we were forced to skip the 2011 burn because the state fire marshall banned residential burn permits due to high wind and drought conditions. The 2012 burn did not go well. The vicissitudes of life demanded that we burn on a day when the dew point was too high, which compounded a problem particular to this prairie restoration. Damp leaf duff, dropped from the pin oak tree on the opposite side of the yard, sometimes accumulates between the prairie plants. This keeps the dead organic matter damp, making it more difficult to burn. Finally, the wind was blowing toward our house rather than away from it: we were forced to burn against the wind, for safety’s sake, rather than with the wind, which is the most efficient way to achieve a hot fast burn. Breaking dormancy: New England aster? The result has been the proliferation of invasive or unwanted species, species capable of literally smothering the warm-season grasses and forbs only now breaking dormancy. Without fire, I can only try to control this development by hand-weeding. And hand weeding. And hand weeding until fall when I might be able to perform an early two-year burn (a problem itself). I shudder to weed the prairie. Imagine Ma and Pa Ingalls hand-weeding the tall-grass prairie. Paint me into the picture keeping in mind that I am not so enterprising and hardy a person as they were. Think about it: every aster root is an underground networked monstrosity. The Missouri Primrose has a root like a daikon radish. The horrid ragweed grows in colonies, tightly packed together, the roots tucked cleverly under the curb beyond the reach of any garden tool. These roots are designed by the Devil (I’m sure) to break “somewhere,” leaving tiny pieces of future pestilence tucked within the roots of the delicate Prairie Dropseed or the lovely Little Bluestem. I know the task is futile. I work, ever mindful of the fact that every ounce of soil I disturb brings thousands of seeds to the surface. Some of those seeds belong to the prairie: the annual bundleflower, the wild senna, the ironwed and grey-headed coneflower. Others do not – ragweed, dandelions, lamb’s quarters, man-eating rugosa, and mulberries with 25 feet long root systems. 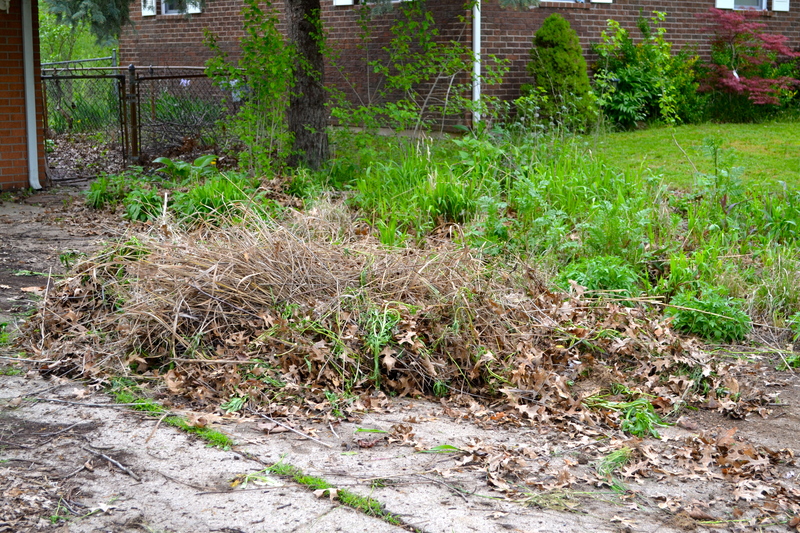 In normal years, prairie tasks include raking the area reasonably clear of oak leaves in the autumn and spring. Sometimes I dig up plugs of plants and give them to friends, or move them to an empty spot in the backyard. Every three years, I enjoy the drama of setting my front yard on fire. In normal years, this is all the work the prairie takes. In normal years. We have not had a normal year in four years. And it shows in this year’s prairie. This entry was posted in Garden Journal Entries and tagged backyard ecosystems, Ecosystem, Garden, Gardening, organic gardening, Organic horticulture, Perennial plant, prairie restoration, suburban ecosystems. Nice post! Good luck with it – we made the mistake of actually planting the native Missouri Primrose in what I thought would be a controlled area – I’ll be transplanting some up on our dry, sandy hill, but the others will DIE – one way or the other! Hey there, JanMont: thanks for the comment. Missouri Primrose (this is the tall vertical variety. There is a creeping oenothera as well… same vibrant yellow, somewhat aggressive, but nothing like this monstrosity) was one of my first major gardening errors. Still paying for it. ROFL! I once had to lift every plant out of a bed and dig for those damn primrose roots inch by inch. They should come with a warning label! Your prairie is gorgeous, weeds and all! BTW – I’d love to set part of my yard on fire just to horrify the HOA. Your prairie garden shows a domesticated prairie, but lovely! I guess it can only be done easier in temperate countries like yours, but i can relate to the problems you’re facing now most especially because of the changing environmental conditions. Here, prairies don’t behave as nicely as yours, we don’t have one by the way in the tropics. We don’t get vast lands with mostly only a few species growing. That is complemented by our diversity forests unlike yours that is mostly composed of few species in an area; e.g. coniferous trees. So raising mostly native species for aesthetic purposes is difficult. Our global conditions are truly changing and it is already visible and experienced, i hope it just dont drastically change that most of us can’t adapt. Thank you so much for dropping by my blog. I surely appreciate the work that you are doing in your country. Not the one that still cry moo though…heehee…I thought they look pretty. They even give flowers! I wish I had a buffalo to loan you, but they are rare in NY unless you are talking about the city. 😉 Your prairie lawn is beautiful. Good luck with those invasives until you can burn again. I am sure you will have it back under control eventually. Thank you so very much, Jessica, for your many kind comments on my blog. Thanks for visiting, and following. I look forward to reading more about your progress at Cape of Dreams!